Free Linux LV2 Answer to NI Massive – Sorcer! 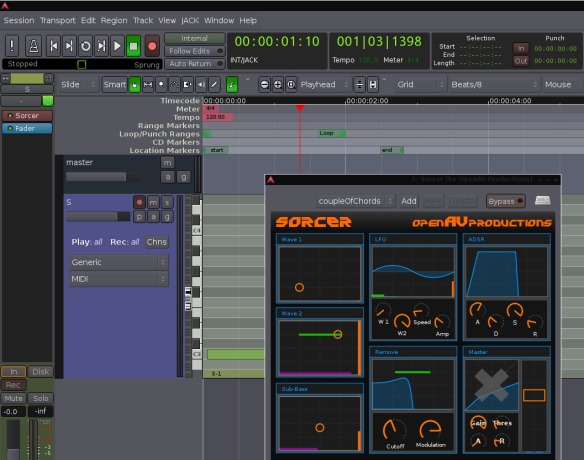 The plugins avalible for Linux just keep getting better and better. I recently found this amazing bass synth called Sorcer that is capable of creating those huge, sub bass, worbly, buzzy dubstep style basses similar to NI Massive. Massive will sorta run on Linux with wine, but it’s super glitchy and doesn’t allow you do really select any presets or do much at all really. If you’re using windows or mac it’s no problem, but now there’s an answer for Linux with this awesome LV2 Plugin. This entry was posted in Linux, Plugins and tagged free lv2 plug-ins, lv2 bass synth pedal, lv2 bass synth plugin, lv2 bass synth wah, lv2 bass synthesizer, lv2 plug-ins, ni massive, ni massive download, ni massive manual, ni massive presets, ni massive torrent, ni massive tutorial, what are lv2 plug-ins on October 3, 2017 by DemonicSweaters.